Romney, Ryan are calling themselves "America's Comeback Team"
As sprint to the November election gets under way, Mitt Romney and his running mate, Paul Ryan, are pitching themselves as "America's Comeback Team," Republican turnaround artists willing to take on tough decisions facing the economy, entitlement programs and the role of government. Countering, President Barack Obama and his allies assert that adding the conservative Wisconsin congressman to the Republican ticket creates a sharp choice for voters on the future of the nation's tax system and safety-net programs, such as Medicare and Social Security. Romney's selection of Ryan as his vice presidential running mate this weekend jolted the presidential contest and set the contours for the fall campaign: Romney as a proponent of a friendlier business climate seeking to revitalize the economy and rein in federal spending while Obama seeks to cast himself as a defender of middle-class families and federal spending on health care, retirement pensions and education. Within minutes of Ryan claiming a spot on the ticket, conservatives celebrated and Democrats pounced. Still, the fundamentals of the campaign remained unchanged: a race defined by a weak economy and high unemployment, measured most recently at 8.3 percent in July. Recent national polls as well as surveys in several battleground states indicate a narrow advantage for Obama, though Romney hopes to get a boost of momentum from the attention he was getting with his running mate announcement. It remains uncertain whether Ryan on the ticket will influence the state-by-state race to reach the 270 Electoral Votes needed to claim the White House. Democrats say Romney's embrace of Ryan, the architect of a controversial long-term budget plan remaking Medicare and cutting trillions in federal spending, could open the door for Obama with older voters in battleground states like Florida, Ohio and Pennsylvania. Republicans say Ryan could help put Wisconsin, which traditionally has voted Democratic in presidential campaigns, in play and that the Catholic Midwesterner also could appeal to blue-collar voters that Romney, a Mormon and multimillionaire, has struggled to reach in Iowa and elsewhere. The campaigners have three months to make their case, with the national party conventions coming in just weeks and the series of presidential debates scheduled for October. Both presidential tickets were wasting little time plunging into the next phase of the campaign. On Sunday, Romney — and his new sidekick — were set to appear at rallies in North Carolina — a competitive state in the race — as part of a multi-state bus tour before ending the day in Waukesha, Wis., in a homecoming-themed event for Ryan. 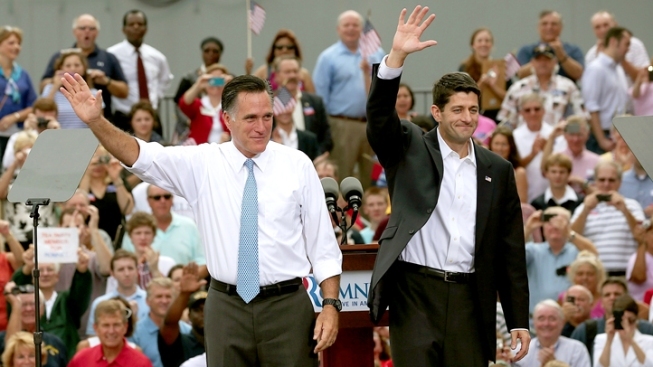 Romney then planned to head to Florida and Ohio as the week begins, while Ryan was scheduled to travel to Iowa on Monday as the ticket looked to cover as much ground as possible. Obama, for his part, was starting a three-day bus tour of Iowa on Monday, signifying the importance of the toss-up Midwestern state. And he was dispatching Vice President Joe Biden to North Carolina on Monday followed by a two-day swing through Virginia starting Tuesday. But first, Obama was to host a series of birthday-themed fundraisers Sunday in Chicago. He kept a low-profile Saturday, meeting privately with top aides at his downtown Chicago campaign headquarters as Romney introduced Ryan to cheering supporters at a trio of events in Virginia. In Norfolk, Romney said Republicans would present economic solutions "that are bold, specific and achievable," vowing to create 12 million new jobs and "bring better take-home pay to middle class families." Ryan, who at 42 is a generation younger than Romney, said Republicans would eliminate the nation's "debt, doubt and despair." Obama left it to his campaign advisers and Democratic allies to tear into the choice of Ryan. They said Ryan on the ticket would hurt Republicans with older voters, middle-income families and women in November. "His plan would also end Medicare as we know it by turning it into a voucher system, shifting thousands of dollars in health care costs to seniors," he said. Some party officials noted that Newt Gingrich, the former House speaker and one-time Republican presidential candidate, referred to Ryan's plan to overhaul Medicare as "right-wing social engineering," a line that Democrats envisioned in attack ads. Gingrich later apologized.